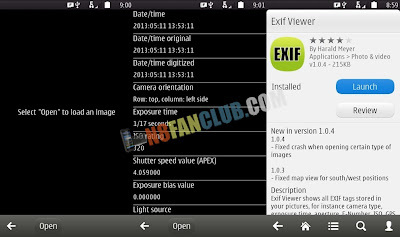 Exif Viewer shows all EXIF tags stored in your pictures, for instance camera type, exposure time, aperture, F-Number, ISO, GPS position, and many more (only tags which are stored in your photo are shown). If the picture contains GPS information then the position can be viewed with the integrated Google Maps viewer. New: functions to remove location data from pictures. Compatible with S^3 / Anna / Belle Smart Phones.